Modular sectional upholstered in softly textured grey fabric with an included storage ottoman is perfect for living rooms of all sizes. 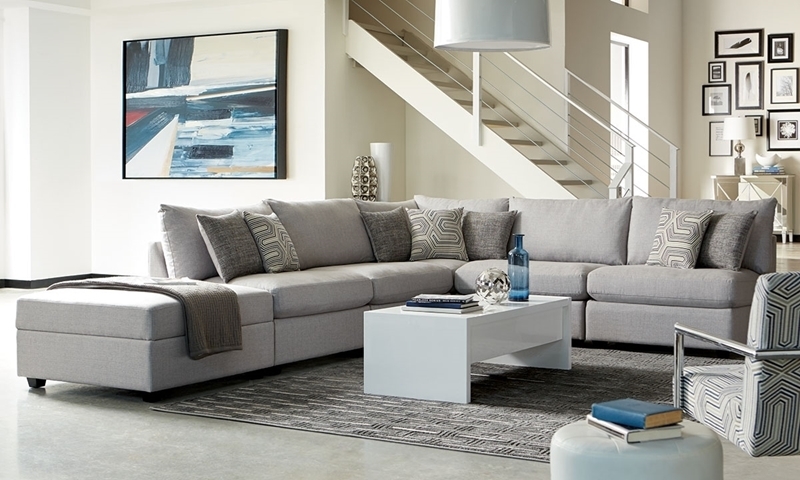 Create the perfect casual contemporary look to fit your living room with the Charlotte sectional from Scott Living. This modular piece comprises four armless chairs, a corner wedge and storage ottoman completely upholstered in textured grey fabric, so that you can arrange them however you please. A kiln-dried hardwood frame, Marshall coil base and sinuous springs provide durability and lasting support for its luxuriously soft feather down wrapped cushions and plethora of double-sided toss pillows.